a. – (-----); a celebrated man, said to be chief of his tribe; his ears curiously slit and elongated and ornamented. b. – (-----); an Iquito woman, wife of the chief. c. – (-----); a good looking man, a fair specimen of the tribe, and said also to be a chief. A very small tribe, reduced by small-pox and dissipation, and mostly residing in one small village, on the bank of the Amazon, near Nauta. 1853. 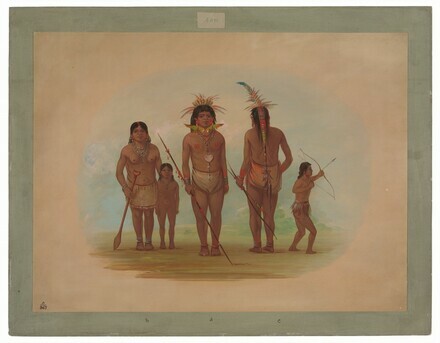 An Exhibition of Paintings and Lithographs by George Catlin, Artist Historian, Tennessee Fine Arts Center, Nashville, 1971, no. 33. American Paintings and Sculpture: An Illustrated Catalogue. National Gallery of Art, Washington, 1970: 34. American Paintings: An Illustrated Catalogue. National Gallery of Art, Washington, 1980: 65, repro. American Paintings: An Illustrated Catalogue. National Gallery of Art, Washington, 1992: 111, repro.